London (AFP) – Global equities took a step back Friday from this week’s rally after quarterly data showing China’s powerhouse economy grew at its slowest rate in seven years and ahead of a key oil producers’ meeting. Investors appeared to have taken their cash off the table after a week of gains, sending most stock markets lower, analysts said. Europe’s main bourses all ended the session in the red while shares on Wall Street were largely stable. “The strong weekly performance in European markets stalled on Friday,” said CMC Markets analyst Jasper Lawler. The oil market moves centre-stage this weekend when major crude producers descend on Doha on Sunday to discuss a possible deal to curb output. Shares around the world have piled higher this week as a series of upbeat data from China and a surge in oil prices fuelled hopes for the global economy. Hong Kong, Shanghai and Seoul each shed 0.1 percent. Tokyo meanwhile gave up 0.4 percent, with big-name firms Sony, Toyota and Honda among the key losers. Sony dived 3.2 percent and Honda one percent. Japanese investors were cautious following a powerful 6.5-magnitude earthquake that struck the country overnight, killing at least nine people and forcing the closure of the factories of several major manufacturers. However, the losses around the region were limited, while China released another batch of economic data. Beijing said the Chinese economy, a crucial driver of global growth, expanded 6.7 percent in January-March. That was the weakest quarterly result since the depths of the financial crisis in 2009, but was in line with expectations. The government also released forecast-beating investment, sales and industrial output figures for last month that reinforced hopes a growth slowdown in the economy may be bottoming out. “Stocks are shrugging off another dose of stronger-than-expected Chinese economic data, with caution likely prevailing ahead of this weekend’s key production meeting between major world oil producers in Doha, with expectations elevated regarding a resulting freeze in output,” the Charles Schwab note said. China’s quarterly growth figures weighed on mining stocks as China is the world’s biggest consumer of many raw materials. Anglo American sank 3.6 percent to 665 pence, Glencore shed 1.9 percent to 155 pence and Rio Tinto dipped 1.4 percent to 2,210 pence. Analysts said the data indicated that some sense of stabilisation had finally set in following a series of stimulus measures. 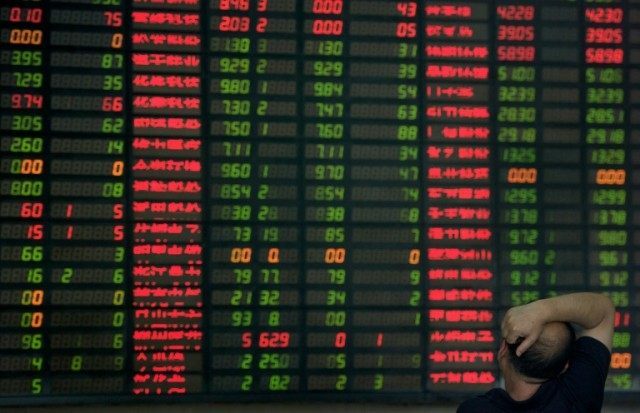 World markets were sent into spasms at the end of last year and the start of 2016 by worries over the state of the Chinese economy and Beijing’s handling of the crisis.